Governor Blagojevich of Illinois has been arrested by the FBI on Tuesday involving federal corruption charges in relation to trying to sell the vacant Senate seat that was available since Barack Obama left the Senate as President-Elect. Obama suggests that public trust has been violated, and that the Governor must step down from office, regardless of any findings in the case. Public trust is one of the main reasons why Barack Obama ran for office in the U.S. Senate and eventually for the President of the United States, as he says "Part of the reason that I got into politics, ran for the state Senate, ran for the United States Senate and ultimately ran for the presidency is because we have to reclaim a tradition of public service that is about people and their lives and their hopes and their dreams. And it isn't about what's in it for me,". 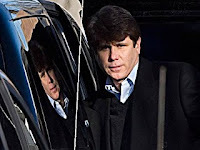 Regardless of what has transpired so far, Governor Blagojevich has returned to work after his arrest, but eventually must resign or be impeached by the Legislature out of office. In any case, it is a big embarrassment for him and his family. Another option is to go to the Supreme court and ask the top court in the land to declare basically that the governor is unable to serve. The person that most likely will take office when the position is vacated is Lt. Governor Pat Quinn.